We had a cousin sleep over to start our spring break. It was a lot of fun...very busy with 6 kids but SO MUCH FUN! 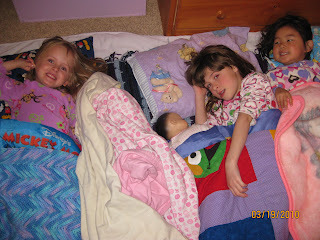 Here are the girls "trying" to go to sleep and our sweet little Railyn. 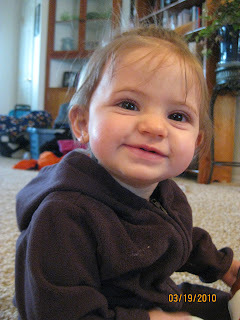 Railyn has decided Uncle Brian is a little scary...kind of funny since cousin Abby was the same as a baby! And now a week of very little schedule and welcoming spring in! We were doing the same thing...there are 6 girls who are all 11 months apart starting at 15 and going down....they adore each other and get together at Nanny's house whenever possible....LOVE the picture!! !